The University of the Philippines is one with the Filipino people in celebrating the 150th birth anniversaries of Apolinario Mabini and Isabelo delos Reyes. Known as the the “Brains of the Revolution,” Mabini is one of the country’s most important intellectuals. Delos Reyes, the “Father of Filipino Socialism,” was an indefatigable journalist, folklorist, politician, and labor activist. 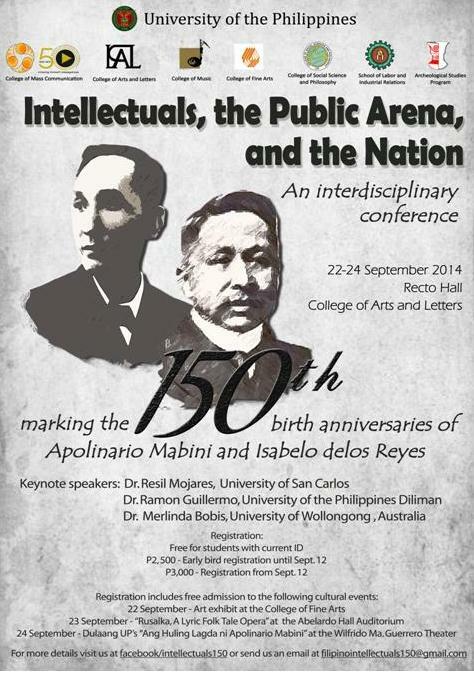 To celebrate their lives and legacies, the international and interdisicplinary conference, titled“Intellectuals, the Public Arena, and the Nation,” will be held on 22 to 24 September 2014 at the College of Arts and Letters Auditorium, University of the Philippines, Diliman, Quezon City, Philippines. Noted scholars and writers, Resil Mojares (University of San Carlos), Ramon Guillermo (University of the Philippines), and Merlinda Bobis (University of Wollongong) will keynote the conference. Bobis will also read from works her works and new book Dream Stories (Anvil) will be launched. Close to 60 papers on wide-ranging disciplines will be presented on themes including people’s struggles; media and society; artists, writers, and musicians as intellectuals; archaeology and history of ideas; performance and public spaces; narratology and authorship; aesthetic traditions; pedagogy and university life. Among the presenters are Joyce Arriola, Glecy Atienza, Arnold M. Azurin, Grace Barretto-Tesoro,Jose Buenconsejo, Patrick Campos, Wystan de la Peña, Alfredo Diaz, Jimmy Balud Fong, J. Neil Garcia, Eli Guieb III, Antonio Hila, Corazon Hila, Maria Alexandra Iñigo-Chua, Lisa Ito-Tapang, David R.M. Irving, Rene Javellana, Diosa Labiste, JPaul Manzanilla, Raul Casantusan Navarro, Choy Pangilinan, Michael Pante, Raul Pertierra, Rommel Rodriguez, Christian Tablazon, Judy Taguiwalo, Rolando Tolentino, and Jose Victor Torres. The conference is organized by the College of Mass Communication, in partnership with the Archeological Studies Program, College of Arts and Letters, College of Fine Arts, College of Music, College of Social Science and Philosophy, and the School of Labor and Industrial Relations. The conference is free for students, while a minimum conference fee of P3,000 will be charged for other participants. Tickets to the opera Antonín Dvořák’s Rusalka, on 23 September, at the Abelardo Hall, and Dulaang UP’s Ang Huling Lagda ni Apilinario Mabini, on 24 September, at Wilfrido Ma. Guerrero Theater, may be availed as part of the conference fee, on a first-come, first-served basis.For more details, email [email protected], visitwww.facebook.com/intellectuals150, or call the Secretariat at 920 6864.